Rear End Gears – Commercial Gear & Sprocket Company, Inc. Early automobiles used spur gears instead of bevel gears; however, epicyclic gearing is being used in more technologically advanced applications. For instance, the Toyota Prius utilizes epicyclic gearing in its automotive drive train in order to apply torque asymmetrically. This type of rear end gear has the advantage of being compact along the length of its axis, which is also called the sun gear shaft. The typical set up of a rear end gear includes sets of bevel gears, axles, shafts and a differential carrier. Bevel gears may have straight teeth, or they may be spiral bevel gears with curved teeth, similar to helical gears. The bevel gears in the rear end gear are arranged into epicyclic configurations that allow various attached axles to turn at different speeds. The spiral bevel pinion gear is encased within the housing of the final unit and is driven by torque transmitted from the end of the propeller shaft. 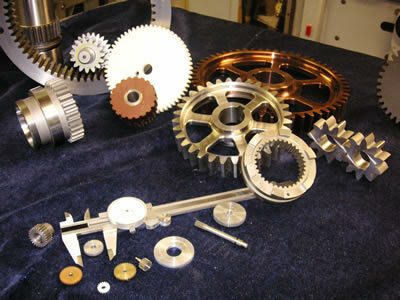 The pinion gear interlocks with the large spiral ring gear, which is also known as a crown wheel. The crown wheel is attached to the differential carrier, which contains a cluster of four opposed bevel gears in a perpendicular plane. 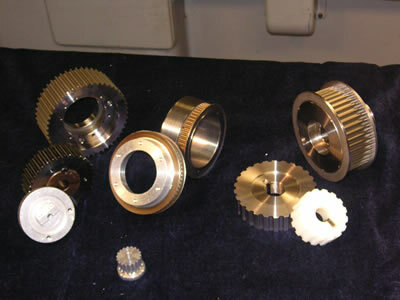 These four bevel gears work by each gear meshing with its two neighboring gears but treating the third gear differently by rotating counter to it instead of meshing. The epicyclic configurations of the bevel gears allow for two sun gears and two planet gears. The two sun gears are aligned on the same axis as the crown wheel and serve to drive the axle half shafts that connect the wheels. The two planet gears are aligned on a perpendicular axis whose orientation is affected by the crown wheel’s rotation. The crown wheel is rotated as a result of the rotation of the differential carrier. Upon rotation, the changing orientation of the axis transfers the crown wheel’s motion to the sun gear by pushing on them as compared to turning against them. Since the two planet gears are not restricted from turning against each other, the sun gears can counter-rotate relative to both the crown gear and each other under the same force. Rear End Gears Find rear end gears manufacturers and rear end gears suppliers from IQS Directory. Refine your search below by location, company type and certification to find rear end gears manufacturers and suppliers. Use the time-saving Request for Quote tool to submit your inquiry to all the rear end gears companies you select.